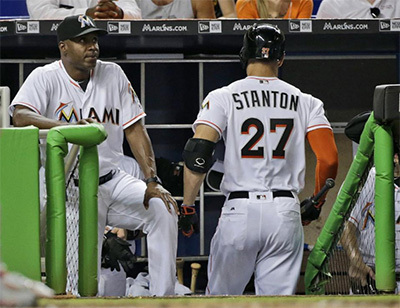 The Miami Marlins' cleanup hitter and batting coach spent more than half an hour together before Friday's game against Washington trying to solve the slump. There was no immediate turnaround - Stanton went 0 for 4 with three strikeouts in a 4-1 loss. A 4-for-45 funk has dropped Stanton's average to .214, and he has struck out 12 times in the past four games. He has 11 homers, but only one RBI since May 6.